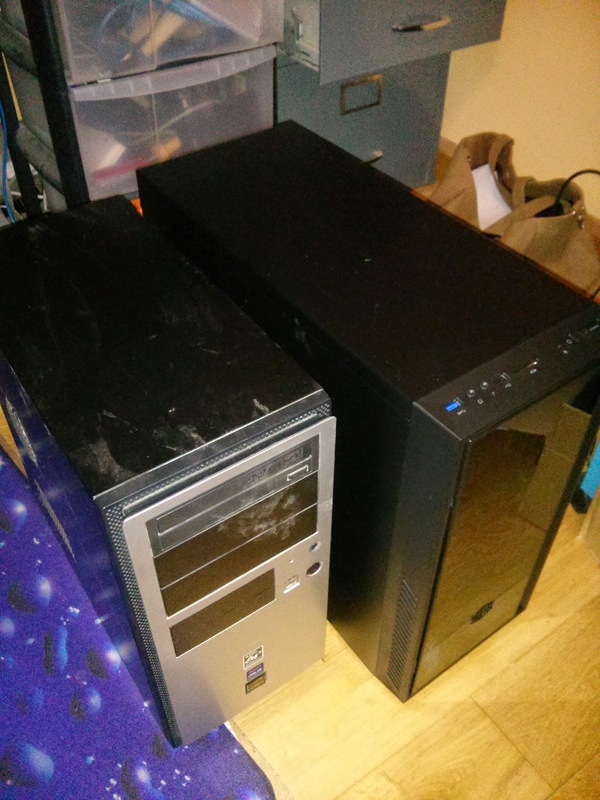 A while back I blogged about my PC. It has served me well for about seven years, but has been showing signs of age lately. There's some hardware issue that causes it to lock up at times and it seemed to struggle with modern web video, e.g. HD Youtube or G+ video hangouts. Things have moved on a lot since I built it, so I finally pulled the trigger on a new build. I've gone with AMD processors in the past and sort of know what to expect from them, so I went with the A8 6500. The price is reasonable and it's a 65W chip which should run a little cooler than some of the others. I've used nVidia graphics that came on the previous motherboards, but this processor incorporates Radeon graphics that should be supported on Linux. Motherboard is a Gigabyte GA-F2A88X-D3H (eh?). I wanted a couple of PCI slots for my old cards. This seemed to have all the connections I need, but won't support any old IDE drives. I didn't order an optical drive as I was thinking of re-using my old one, but it won't work with this. It's not expensive to but a new one, a big change since I paid about £150 for a DVD/CD-RW combo drive many moons ago. I've gone for 8GB of memory for now. It's from Crucial, who have a good reputation. I've never had memory with heatsinks on before. I don't plan to overclock, but I want everything to be stable. Storage is via a 120GB Kingston SSD for the operating system and a 2TB Seagate for data. I paid more than previously for a case to try and keep the noise down. The Cooler Master Silencio 550 has foam on the sides and a door on the front to contain the noise. Power is from a Be Quiet L8 350W PSU. All the parts came from +Ebuyer.com, who I have used in the past and have no problems with. It was pretty easy to put together. It's easier in a large case. I like the screw-less drive mountings. It's a shame nobody has come up with a simpler way to wire up the case switches and lights. There was a moment of drama when a glass lampshade above the dining table dropped into the open PC. Luckily it didn't break, but it gave me a shock. It's a new light, but it looks like the glue failed on that shade. Something else to get fixed. I installed my old M-Audio Delta 66 audio interface and my Freeview TV card. Installing Kubuntu Linux from a flash drive did not take long. Everything is working nicely. Linux hardware support is really good these days. It's probably easier than Windows. I have an issue with the sound distorting that I still need to investigate. So is this PC really quiet? It's certainly quieter than the old one, but not silent. I used the standard AMD CPU cooler and I can hear that. It may be annoying enough to replace, but I don't really hear anything else. I've run a few tests on the things that were stressing the old machine and this one has plenty of spare capacity.I'm hoping it will last me a good few years. I still need to set up the recording apps. I'll be using the KXStudio suite again. I need to copy files over from the old machine. I tried it over the network using both Samba and SSH/FTP, but both were incredibly slow. What I could do is to just mount the old drive. That should be the quickest way. I intend to keep the old PC as a spare in the study. My kids use the computer a lot for schoolwork.